CBI - China: Day 154 of 154 of the Japanese Invasion of Manchuria. A Japanese victory. CBI - China: Day 22 of 41 of the 1st Battle of Shanghai. CBI - China: Day 49 of 142 of the 1st Battle of Hebei. Spain: Day 217 of 985 of the Spanish Civil War. Spain: Day 582 of 985 of the Spanish Civil War. CBI - China: Day 227 of 2,987 of the 2nd Sino-Japanese War. Day 12 of 124 of the Battle of Henan. Spain: Day 947 of 985 of the Spanish Civil War. CBI - China: Day 592 of 2,987 of the 2nd Sino-Japanese War. Finland: Day 81 of 105 of the Russo-Finnish War. CBI - China: Day 957 of 2,987 of the 2nd Sino-Japanese War. Day 96 of 381 of the Battle of South Guangxi. Day 22 of 67 of the Battle of Wuyuan. ETO - UK: Day 166 of 258 of the Blitz. East Africa: Day 254 of 537 of Italy's East African campaign in the lands south of Egypt. East Africa - Eritrea: Day 14 of 56 of the Battle of Keren. CBI - China: Day 1,323 of 2,987 of the 2nd Sino-Japanese War. Day 20 of 31 of the Battle of South Henan. CBI - Malaya: Elements of the Australian 8th Division arrive in Singapore. CBI - Thailand: Day 141 of 221 of the Franco-Thai War (Vichy France vs Thailand). Atlantic: Day 36 of 169 of Germany's Second "Happy Time," during which U-boats sink 609 Allied ships with little risk. Russian Front - North: Day 164 of 872 of the Siege of Leningrad. Russian Front - North: Day 11 of 102 of the Battle of the Demyansk Pocket, another failed attempt to break the siege at Leningrad. Russian Front - North: Day 27 of 103 of the Battle of the Kholm Pocket. Another attempt to break the siege at Leningrad. Russian Front - Center: Day 42 of 103 of the Battle of Vyazma, Russia. Russian Front - Center: Day 42 of 103 of the Battle of Sychevsk, Russia. Russian Front - South: Day 112 of 248 of the Siege of Sevastopol, Crimean Peninsula. All German attacks against Sevastopol are stopped for the winter. CBI - Burma: Day 67 of 164 of Japan's Invasion of Burma. CBI - Burma: Day 5 of 5 of the Battle of the Bilin River. Japanese troops take this key area in Burma. CBI - China: Day 1,688 of 2,987 of the 2nd Sino-Japanese War. Day 57 of 99 of the 3rd Battle of Changsha. PTO - Borneo: Day 65 of 107 of the Battle of Borneo. PTO - Dutch East Indies: Day 1 of 3 of the Naval Battle of Badung Strait off Bali. Results in a Japanese naval victory. PTO - Philippines: Day 73 of 152 of the 1st Battle of the Philippines. 5th Air Force provides air support. Germany: The Gestapo arrests leaders of the non-violent, intellectual German resistance group White Rose in Munich. They will all soon be executed by beheading. Today, they are honored among Germany's greatest heroes for their opposition to the Third Reich in the face of death. 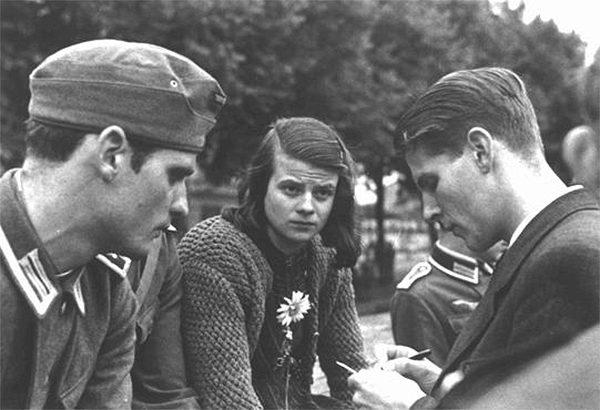 From left: Hans Scholl, his sister Sophie Scholl, and Christoph Probst. The group became known for an anonymous leaflet and graffiti campaign, lasting from June of '42, that called for active opposition to dictator Adolf Hitler's regime. Today, the members of the White Rose are honored in Germany amongst its greatest heroes, having opposed the Third Reich in the face of death. In this scene from the 2005 powerful-beyond-description movie, Sophie stands before the People's Court (Volksgerichtshof) which had been created to conduct show trials of those accused of political offenses against Hitler's dictatorial regime. It almost always sided with the prosecution, to the point that being hauled before it was tantamount to a death sentence. ETO - UK: US 8th Air Force: Flying Spitfires, the 4th Fighter Group fly shipping and defensive patrols over the Channel. Germany: In Berlin Dr Goebbels announces the implementation of "total war" which, for the first time, mandates the employment of German women in the war effort. Russian Front - North: Day 529 of 872 of the Siege of Leningrad. Russian Front - North: Day 9 of 51 of the USSR's Operation POLAR STAR, a failed offensive north of Leningrad, hoping to take the southern shore of Lake Ladoga, Russia. Russian Front - North: Day 290 of 658 of the Siege of the Kholm Pocket, USSR lays siege to the Kholm Pocket but the Germans hold out for a about a year and a half. Russian Front - South: Day 69 of 69 of the USSR's Operation LITTLE SATURN ends in a Soviet victory, as the Germans have left the Northern Caucasus and much of the Donets Basin. MTO - Tunisia: Day 94 of 178 of the Battle of Tunisia. British 1st Army engages the Germans in the Sbeitla-Kasserine-Feriana areas. RAF and US Air Forces provide Allied air support. CBI - Burma: Day 60 of 104 of the 1st Battle of Arakan. US 10th Air Force provides air support. CBI - Burma: Day 11 of 79 of the Allied Operation LONGCLOTH. CBI - China: Day 2,053 of 2,987 of the 2nd Sino-Japanese War. PTO - Alaska: Day 257 of 435 of the Battle of Kiska, Aleutian Islands. US 11th Air Force P-40s shoot down 2 enemy fighters over Amchitka Island. Russian Front - North: Day 655 of 658 of the Siege of the Kholm Pocket. USSR lays siege to the Kholm Pocket but the Germans hold out for a about a year and a half. Russian Front - North: Day 36 of 48 of the Battle toward the Narva River, Estonia. This drive helped lift the Leningrad siege and goes on to liberate Narva. The Soviets recapture Staraya, Russia, as the Germans fall back to the Narva-Pleskau-Oposhka line. Russian Front - North: Day 17 of 191 of the Battle of the Narva Isthmus, Estonia. Russian Front - South: Day 57 of 113 of the USSR's Dnieper-Carpathian Offensive in southwestern Ukraine. Russian Front - South: Day 20 of 31 of the Battle of Nikopol, Ukraine. MTO: The cruiser HMS PENELOPE is sunk by U-410 off Naples and earns the distinction of being the last British cruiser to be lost in the war. MTO - Italy: Day 33 of 123 of the Battle of Monte Cassino. Renewed Allied attacks at Cassino are broken off but the New Zealand troops do capture the Cassino Station. RAF and US Air Forces provides air support for the Allied ground troops. MTO - Italy: Day 28 of 136 of the Battle of Anzio. The Germans make further gains at Anzio but are repulsed by Allied artillery and warships. RAF and US Air Forces provides air support for the Allied ground troops. CBI - Burma: Day 51 of 99 of the 2nd Battle of Arakan. CBI - Burma: Day 14 of 19 of the Battle of the Admin Box. US 10th Air Force provides air support. CBI - China: Day 2,418 of 2,987 of the 2nd Sino-Japanese War. CBI - Indochina: US 14th Air Force attacks targets on land as well as shipping in the Gulf of Tonkin. PTO - Marshall Islands: Day 3 of 8 of the Battle of Eniwetok. US 7th Air Force provides air support. PTO - New Guinea: Day 153 of 219 of the Battle of Shaggy Ridge. 5th Air Force provides air support. PTO - New Guinea: Day 150 of 162 of the Battle of the Huon Peninsula. 5th Air Force provides air support. PTO - New Guinea: Day 66 of 597 of the Battle of New Britain. US 13th Air Force provides air support. PTO - Solomon Islands: Day 110 of 295 of the Battle of the Bougainville Islands. US 13th Air Force provides air support. Atlantic: A Russian torpedo hits a Nazi cruise liner leaving Danzig for Denmark with 5,000 refugees and 3,800 U-boat personnel on board. Only 1,000 are reported as saved. ETO - France: Day 202 of 284 of the Battle of Brittany. ETO - France: Day 157 of 236 of the Siege of Dunkirk. ETO - Germany: Day 11 of 16 of Operation GRENADE, the US drive into Germany. US 9th Air Force provides air support. ETO - Germany: Day 11 of 17 of Operation VERITABLE, the British and Canadian drive into Germany. ETO: Day 30 of 66 of the Battle to the Rhine. US 9th Air Force provides air support. Russian Front - Finland: Day 157 of 223 of the Lapland War. Finland and Russia have joined forces to kick the Germans out of Finland's most northern province. Russian Front - Center: Day 127 of 206 of the Battle of the Courland Pocket in Latvia. Russian Front - Center: Day 25 of 75 of the Battle of Königsberg, East Prussia (now Kaliningrad, Russia). Russian Front - Center: Day 24 of 63 of the Battle of the Heiligenbeil Pocket in East Prussia. Russian Front - Center: Day 9 of 54 of the Battle of East Pomerania, Germany. The Soviets encircle Graudenz on the Vistula River. Russian Front - Center: Day 11 of 17 of the USSR's Lower Silesian Offensive (Poland). Russian Front - Center: Day 6 of 83 of the German Siege of Breslau (today Wroclaw, Poland). Russian Front - Center: Day 18 of 31 of the Battle of Schwedt, Germany. MTO - Austria: US 15th Air Force B-17s bomb several targets at Linz. CBI - Burma: Day 31 of 61 of the Battles of Meiktila and Mandalay. The US 10th Air Force provides air support. CBI - Burma: Day 29 of 39 of the Battle of Ramree Island. The US 10th Air Force provides air support. CBI - Burma: Day 15 of 99 of the Battle of Pakokku and Irrawaddy River operations in central Burma. The US 10th Air Force provides air support. CBI - China: Day 2,784 of 2,987 of the 2nd Sino-Japanese War. US 14th Air Force attacks targets in China and shipping in the South China Sea. PTO - Alaska: US 11th Air Force B-24s fly cover sorties for a naval force during its approach to Kurabu Cape, Paramushiru Island. PTO - Marshall Islands: US 20th Air Force B-29s bomb two airfields on Moen Island, Truk Atoll. PTO - New Guinea: Day 419 of 597 of the Battle of New Britain. PTO - New Guinea: Day 303 of 481 of the Battle of Western New Guinea. PTO - Philippines: Day 122 of 299 of the 2nd Battle of the Philippines, aka the Liberation of the Philippines or the Philippines Campaign. PTO - Philippines: Day 66 of 244 of the Battle of Luzon. 5th Air Force provides air support. PTO - Philippines: Day 19 of 22 of the Battle of the Bataan Peninsula. 5th Air Force provides air support. Except for a few small isolated pockets, US troops capture the whole of the Bataan Peninsula. PTO - Philippines: Day 16 of 29 of the Battle of Manila.